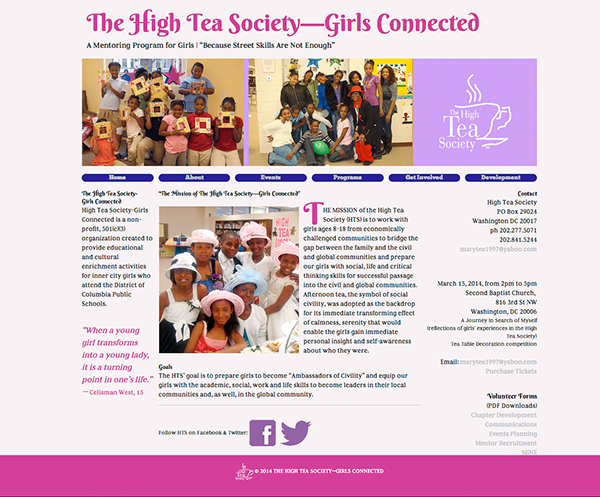 The mission of the High Tea Society (HTS) is to work with girls ages 8-18 from economically challenged communities to bridge the gap between the family and the civil and global communities and prepare our girls with social, life and critical thinking skills for successful passage into the civil and global communities. Afternoon tea, the symbol of social civility, was adopted as the backdrop for its immediate transforming effect of calmness, serenity that would enable the girls gain immediate personal insight and self-awareness about who they were. The HTS’ goal is to prepare girls to become “Ambassadors of Civility” and equip our girls with the academic, social, work and life skills to become leaders in their local communities and, as well, in the global community.